I would like to tell you everything, but I made a promise and so I can’t. I will say that I saw a more personal side of Berlin through a Couchsurfing experience. I not only got to meet my host and her child but also a pediatrician from Jordan who was also surfing. It was a great day of talking and sharing and walking and seeing. I learned about what East Berlin was like before the wall fell, the prefab houses and the cardboard cars, the effort to appear powerful to the capitalists west, the good intentions of communism tainted by corruption or by fools who wore the mantle of leadership. I can say that I saw kindness in Berlin–a lot of it. 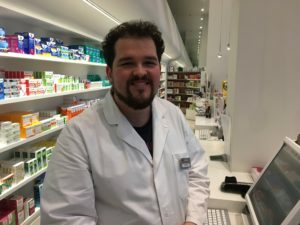 Nils works at a pharmacy in Berlin. He sold me some antiseptic spray and talked to me a little bit about his home city. Nils was very helpful, so I told him about the blog. He told me that he had been “born and bred” in Berlin, so I asked him about his home. I asked him what the real Berlin was for him. I decided that I really wanted to access that experience through CS, and I did. I ate German chocolate ate the famous Rausch, I had Berlin Einer (pig knuckle), I went shopping in a German grocery store, and I learned that many Germans wear their slippers around the house. I saw the Holocaust Memorial, which apparently caused a good deal of controversy not because of the subject but because some people disliked the artistry of it. I saw churches and statues and commercialism and traffic. Berlin is busy. I stood in the square where Adolph Hitler held a massive book burning. There’s a memorial under the plaza that you can see through a plexiglass disc that sits in the middle of the square. I met a tram operator who helped me when I got on his train going the wrong direction. He spoke little English, but his kind-natured smile extended beyond language. I watched a man in a wheel chair trying to get up a ramp in the rain so that he could enter a restaurant. Another man suddenly appeared and helped him up the ramp and into the restaurant before returning to his girlfriend. I learned that Berlin was built on sand, which is why there is a height restriction on the buildings there. I only spent a couple of days in Germany’s capital city, but it was a rewarding experience all around.